Sandomierz Castle. M. Bulinski's drawing in Monografia miasta Sandomierza, 1879. Stronghold existed in 10 century. 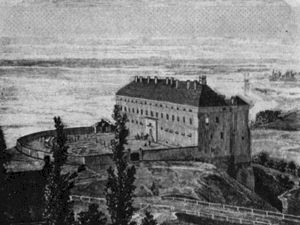 The castle was erected by Casimir the Great and it was in most part destroyed by the Sweds during Potop war ca. 1656. One wing preserved till now. Popiel (Chosciak Popiel) Pawel h. Sulima (1733-1809), commanding officer of the Malopolska Crown army, castellan of Malogoszcz and later of Sandomierz. Far cousin of Krzysztof (vide), he came from the branch of Popiels which according to the Ruthenian court records used to use the by-name Popiel Chwosciak, Fosciak, Fostiak, Kosiak (Niesiecki fixed a form: Chosciak). In the mid-18 century a part of this branch moved to the Sandomierz province and there they entered advantageous marriages with local nobles. In 1697 among electors of August II we have already seven Popiels (not as in father Pietruski's "Elektorow poczet" - 5). The Popiels of Sandomierz province used to use originally the name "Popiel de Popiele". The by-name Chosciak showed up on this Popiel's tomb and was used in 19 cent. by his descendants in Polish order (Chosciak Popiel), not Ruthenian (Popiel Chosciak). Popiel was a son of Konstanty, originally using Ruthenians titles of Master of the Pantry and Gladifer of Zydaczow (1723), later Master of the Pantry and Standard Bearer of Wislica (1754), elector of Stanislaw Leszczynski and MP of Sandomierz for the Parliament session in 1748, heir of Chocimow and Oczkowce in Sandomierz county (sometimes he is mistakenly taken as his namesake Konstanty Popiel, Treasurer and the Officer of Garrison of Radom). Popiel's mother was Marianna Pieglowska, a daughter of the Oswiecim castellan Jan. He brought as a dowry the village Owczary (county of Wislica) and she was a heiress of Czaple Wielkie in Krakow province (county of Ksiaz). Still while his mother was alive, he received a village Owczary (he ceded it to his cousin Kasper) and Czaple Wielkie (1764), and after a death of his brother Stanislaw (1760) he received Chocimow where he settled. In such a manner he was quite stabilized in terms of the estates, he married Konstancja Komorowski (1764), who was orphaned in early childhood by her father Piotr and was grown by her uncle, a primate Adam Komorowski. Written after her death registry of estate, she brought a significant dowry (the registry shows a great deal of jewelry, and also she was a heiress of remarkable estates. Popiel's military and officer's career started from nomination for the Master of the Pantry of Wislica (7-17-1760), MP from Sandomierz province for the extra-ordinary Parliament session in 1761 and a promotion to the Standard Bearer in the regiment of heavy Calvary of the prince Fryderyk Christian (3-22-1762). During interregnum after the death of the king August III he was at the regiment. He was one of seven Popiels who signed up on 7-23-1964 the pro-family act of the Confederation of the Sandomierz province under Stanislaw Lubomirski's staff, and at the election he voted with his province (together with four cousins) for Stanislaw Poniatowski. The new king nominated Popiel to the Standard Bearer of Wislica (3-6-1765). Popiel was not a part (neither his cousins from Sandomierz province) to the Confederation of Bar or Radom. A proof of his pro-royal sympathy was his promotion to the rank of the lieutenant of the heavy Calvary regiment (1767) and appointed by the Military Commission (10-22-1772) an commanding officer of the Malopolska Crown army. His task was to establish an order in the revolting regiments of the Malopolska army (in February 1774 the army accounted for 253 not revolting officers and soldiers). In November 1774 the order was established. In the same year he received Grzegorzewice, formerly a part of the Jesuits' estate (Wislica county). At the beginning of 1775 he got himself into a quarrel with the Kujawy bishop Antoni Ostrowski. As related by Leon Borowski, a corespondent to Karol Radziwill, Popiel "was publicly" in the king's anteroom called by Ostrowski "a robber". These "quarrels between courtiers being friends" attributed Borowski to Stanislaw Lubomirski's intrigue. Popiel, per his superior officer, general Ksawery Branicki supposed to charge the bishop at the court of Parliament, "proving crimen laesae majestatis". A Saxon envoy A. Essen related that the king personally intervened and calmed down the quarrel (12-9-1775). Popiel was decorated with the Order of St. Stanislaw (before 4-15) in spring of 1776. Popiel was recommended by the king to the Sandomierz palatine Maciej Soltyk as a MP candidate and received a mandate. He signed the act of the royalist confederation on 7-23-1776 and was appointed by the Parliament to the Lithuania Military Commission. He went about obtaining an appointment as a commissioner or a counsel, recommended by the chancellor Andrzej Mlodziejowski (remember Sire - he wrote - about Popiel or he will become desperate). Popiel's candidature to the Unceasing Council went wrong in the Parliament (he obtained only 6 votes), but he found another way to get on board of the Commission. When there was an vacancy, he was elected as a commissioner by the Council and appointed by the king to the Department of Army. Since then to the Parliament session in 1788 he was a part of many government agencies. Often he presided to the Council substituting absent speaker Ignacy Twardowski. During that term (till 1778) Popiel became a Malogoszcz castellan (selected by the Council on 7-11 and confirmed by the king on 9-3-1777, however, according with his appointment as a counsel the senator was active in the Unceasing Council "ex ordine equestri". During 1778 Parliament session he was elected as an incumbent and during 1778080 term he again was in the Department of Army. In 1780 he was decorated with the White Eagle Order and during the term 1780-82 he was a member of the Crown Appropriation Commission. During that term the commissioner of the Treasury, Antoni Lubomirski died and Popiel took over the office after him (3-8-1782). It looks that Popiel was in particular interested in the Treasury; it was connected with the membership in the appointed by the king Mining Commission (1782) which was in charge of mining and metallurgy what was his field of experience from the Sandomierz province (known today as a staropolski basin). During the 1782 Parliament session he was appointed by the king as a election commissioner. Popiel was in charge to judge a procedural argument between electors. Also, there was an unrest (Teodor Ostrowski) between the senators, that Popiel tries to introduce himself as a new candidate to the Treasury commission to secure possibility of staying in the office for two terms, while he was appointed the treasurer after death of the previous commissioner, what qualified him for only one more term if elected. For several days there was an argument on that and finally, Popiel crying injustice had to promise that if elected, he will not put his candidature during next election in 1784. Under that condition he was elected. In September 1783 he become a member of the tree-person panel which appointed by the Treasury reviewed malpractice of Jozef Rudnicki, the Teller. Possibility of scandal was great and first in line was the Under-treasurer Roch Kossowski, but the monies were paid up by the guilty party and persecution was abandoned. On 9-9-1783 Popiel was promoted in his military career to the rank of the colonel of the National Cavalry (after S. Lubomirski) and was appointed as a castellan of Sandomierz (7-9-1784). also in 1784 he was again elected to the Unceasing Council and was appointed to the Department of Taxation. Finally, as an incumbent, he was elected once more in 1876 and appointed to the Department of Army. Popiel was more a civil servant than a politician, moderate royalist. His relations with the king Stanislaw August were close, but his correspondence, friendly from the king and martinet from himself does not reveal any particular political intimacy. Various requests for favors like orders and offices, were common enough that time. However, as a provincial matador Popiel was frequent visitor to the Capitol and had frequent private or personal contacts. During the king's tour around the country in 1787 was a king's aide in his one-month visit in the Sandomierz province riding with the king in king's coach. The king was invited to the Popiel's Chocimow and even the court poet Stanislaw Trembecki wrote a poem to that occasion, but on 6-9 1787 the king found the Popiel's house mourning. Popiel's wife died a day before hit by the thunder during holiday procession. Shortly thereafter Popiel joined the king's party in its tour. Popiel had a major part in calming down a quarrel between poet Trembecki and an army general Jan Komarzewski; the quarrel supposed to end up with a duel. Popiel did not have any part in the Four-year Parliament, his visits then in Warsaw and at the court were became rare. In February 1792 under his leadership the Opatow assembly agreed to swear on the new Constitution. He kept himself away from the Bar Confederation (as other Popiels from Sandomierz province), but on 10-10-1792 he wrote to the king: "till now I did nor commit myself to the Confederation". However, the gentry, facing entry of the Russian army into the provinces were waiting for any direction from Popiel, a recognized local leader, substituting the palatine during his sick leave. The castellan was asking the king for advice or orders, so that "he will not become a victim of times". The king's response is not known, Popiel's name does not show up in the records of the Targowica, apart from the summons of 4-13-1793, calling him to take his office as a member of the re-created Unceasing Council (putting together a list of it's members, J. Sievers in Grodno recorded Popiel's name as an incumbent. Finally, he was not a member of the Grodno UC. Before February 1794 local assemblies sessions for election of MP's and kingdom officers J. Igelstrom sent a courier to Chocimow, summoning Popiel so that he immediately reported in Warsaw or at local Targowica representative who knew Russian envoy intentions "because if my thoughts related to the elections were defeated due to your Lordship's or his friends actions, you and your estates may be held responsible for such damages". Further it is known only, that Popiel's sons were active in the Kosciuszko's insurgency. Popiel's grandson, Pawel Popiel in his memories indicated that the grandfather residing in Warsaw mortgaged the estates and to some extent ruined. Probably Popiel contrary to many his contemporaries, did not make himself a magnate on the politics. But from the records it comes that he was a provident and enterprising man; as everybody from the gentry, he frequented the courts of law suing or being sued (also against or by cousins), he used to be not only a mortgagor but a mortgagee, too (Karol Biron, the brother of the prince of Kurlandia - peter, borrowed from Popiel a royal as for the time sum of 60,000 gold coins), held equities, invested money, apart from Grzegorzewice, he was awarded life estate Letkowice subprefecture (Miechow region). Apart from inherited Chocimow and Czaple Wielkie, he owned a rich half of the towns Ozarow and Wyszmontow (Opatow region). That estate is somehow related to his activities in the Mining Commission. The Ozarow estates owned by Andrzej Tarlo were under a lien by certain Antoni Soldenhoff, a director of the Mineral Plant in Miedzianogora, for his unpaid salaries. Soldenhoff sold his rights to Mikolaj Brening and Brening sold the rights to Popiel in 1788, who took over possession of the estates. Soldenhof's creditor, a merchant from Warsaw Andrzej Stronski wanted to make a claim against Popiel's holdings in Ozarow estates, submitting the claim in writing to the king and confederated states (1789). The matter was forwarded to the Parliament session in Grodno in 1793 and the Parliament's special resolution appointed the Treasury Commission to review and judge the case. There is no further information on the matter or records available, but the estates were ceded by Popiel to his older son Onufry. Popiel was a man who remarkably improved the family finances mainly thanks to his relation with the king. His older son surely and the younger probably, were educated in the Knights School and due to his court relations he caused that his second son married Marcin Badeni's daughter. Popiel died on 5-28-1809. Buried in Kunow, parochial church of Chocimow. From his marriage with Konstancja Komorowski (1732-1787) he had daughters: Anna, married to Stanislaw Stadnicki, Petronela, married to Jan Stadnicki and Maria, a wife of Jozef Dunin-Wasowicz and sons Onufry (vide) and Konstanty. Konstanty (1776-1847) is not in the records of the Knights School (K. Mrozowska), but the registry is not complete. According to Adam Chmiel (who knew the Popiels very well, Konstanty Popiel was an graduate of the school and a comrade of Thaddeus Kosciuszko. He is then the very Konstanty Popiel who joined the Kosciuszko's insurgency and Konstanty Popiel from the Cadets who was promoted to the rank of the Standard Bearer of the Crown Artillery (since Popiels family was extremely propagated, there is no assurance). According to the description in the church in Czaple Wielkie: "Twice a Member of Parliament, a member of the Peasantry Commission" Konstanty was a heir of Czaple Wielkie and Chocimow, father of Pawel (vide) and Wincenty (vide). 1787, W. 1787 s. 186-8, 193-4, 204-6, 272,275,278,284,288,293-4; Ostrowski T., Poufne wiesci z oswieconej Warszawy, Wr. 1972; Popiel P., Pamietniki (1807-1892), Kr. 1927 s. 2-3 (poza indeksem); Summariusz materii do prowincji W. X. Lit.sciagajacy z akt Konfederacyi Generalnej O. N.
, W. 1820 II 14-17; Vol. Leg., VIII 836, 945, 969, IX, 3,4, 7, 14, X;- "Gaz. Warsz." 1787 nr z 20 I 23 VI; - AGAD: Arch. Radziwillow Dz. V/1213 (Borowski), Tzw. Metryka Lit. VII/18, 20, 22, 51; B. Czart. : rkp. 683, 687, (Soltyk), 698, 700, 723, 729, 730 (Soltyk), 735, 799 (Mlodziejowski), 929, 930 (Soltyk); B. PAN w Kr. : rkp. 8341 (Teki Pawinskiego, nr 24); IH PAN: Fastnach A., Slowik historyczno-geograficzny ziemi sanockiej w sredniowieczu (mszp. ); Sachsisches Landes-Hauptarchiv w Dreznie: rkp. 3566 (Essen); - Papiery rodzinne u autora zyciorysu. Copyright � 1998. Jan Popiel & Slawomir Popiel.